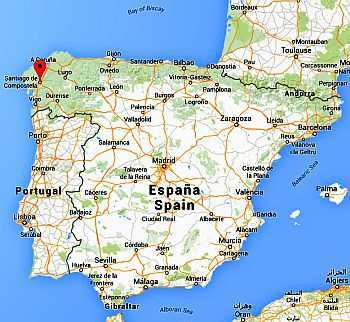 The climate of Santiago de Compostela, the capital of Galicia, located in the northwest of Spain, and famous pilgrimage destination, is cool and moist, in fact it is strongly influenced by the Atlantic Ocean. The daily average temperature ranges from 8.5 °C (47.5 °F) in January and February to 19 °C (66 °F) in July and August. The rains are abundant, and amount to 1,900 millimeters (75 inches) per year; they reach or exceed 200 millimeters (8 inches) per month from November to February; they are also frequent, at least from October to May, when it rains for at least 13 days per month; the only relatively dry season is the summer, especially in July and August, when it rains "only" for 5 days per month. Here is the average precipitation. The wind blows frequently, and can be strong, especially between October and April. Fog is another feature of this climate: it can form all year round, when there is no wind, even on summer nights. Winter, from December to February, is quite mild, but it is also cloudy, rainy and windy. The wind increases the feeling of cold. Very cold days are rare: at most the temperature at night drops to around freezing (0 °C or 32 °F) or a few degrees below. Snow is very rare, and even when it falls, usually there are not large accumulations. Spring, from March to May, is cool, humid and rainy. Atlantic weather fronts pass regularly, and the wind blows frequently. At night it can get cold also in May. But over the weeks, especially from mid-April, the first mild and sunny days occur, thanks to the Azores Anticyclone. Summer, from June to August, is sunny or pleasantly warm during the day and cool at night. Fog often forms at night and in the early morning. Sometimes at night it can get quite cool even in summer, since the temperature can drop below 10 °C (50 °F). Every now and then, there may be hot days, with highs around 35 °C (95 °F). The passage of some Atlantic disturbances over the area cannot be excluded, with a bit of cool and rainy weather, but this occurs less frequently than in the other seasons. Autumn, from September to November, is cool, humid and rainy. In September, especially in the first part, there are still many sunny days, with almost summer-like weather. Sometimes this happens also in early October. The amount of sunshine in Santiago de Compostela is good in summer, when fine weather predominates (but not as in central-southern Spain), while in the other seasons, and especially in late autumn and winter, the sky is often cloudy. Along the northwest coast of Spain, and near Santiago de Compostela, the sea is a bit cold even in summer, as you can see in the following table, regarding the sea temperature in La Coruña. 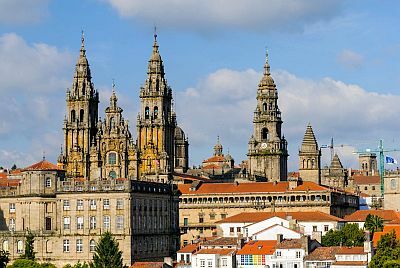 The best time to visit Santiago de Compostela is summer, from June to August or the first half of September, since it is the driest and sunniest time of the year. July and August are the warmest and least rainy months. Some rain must be put into account also in midsummer, and some nights a little cold. Those who suffer from the heat, in order to avoid the albeit rare hot days, can choose May (especially the second half), June and September (especially the first half), keeping in mind, however, that it could rain more frequently.